The survey comprised of ten questions, two addressing technicalities (sprint length and team size) and eight addressing the two most intensive work areas: scrum ceremonies as well as education and training of teammates, stakeholders, and the scrum master herself. Question: How many people are on your scrum team? Two-thirds of the respondents work on a scrum team of at least seven team members. Small scrum teams of four to five people make up less than 20% within the sample. Question: What is your sprint length? Question: How much time do you spend weekly on product backlog refinement sessions? More than half of all respondents spend no more than an hour per week on product backlog refinement sessions. Given that the Scrum Guide allocates up to 10 percent of the sprint to refining the product backlog, this means to be at the low end. Probably, the respondents are not participating the whole time in the product backlog refinement? (The survey was not designed to gain this kind of information. Question: How much time do you spend per sprint on the sprint planning? The sprint planning is the most evenly distributed scrum ceremony: the median value is around 75 minutes. Question: How much time do you spend weekly on daily scrums or standups? Unsurprisingly, given the sizes of most scrum teams in this survey, more than 40 percent of the teams spent between 12 and 18 minutes per stand-up or daily scrum session. On the other side of the spectrum, almost 30 percent of the teams get along with less than 5 minutes per stand-up. Question: How much time do you spend per sprint on the sprint review? Almost haft of the scrum teams spends between 30 and 60 minutes on the sprint review. Interestingly, a fifth of the teams does not have sprint reviews or manages to get through them in less than 30 minutes. Question: How much time do you spend per sprint on the retrospective? Half of the teams spent only 30 to 60 minutes on retrospectives per sprint, more than a third in the vicinity of 90 minutes. Question: How much time do you spend in total per week on training or supporting individual team members? The answers to this questions are wide-spread: more than 10 percent of all respondents spend at least 4 hours per week on coaching other team members. On the other side of the spectrum, 40 percent allocate less than an hour per week on coaching their teammates or do not do this at all. Question: How much time do you spend in total per week on training or supporting stakeholders from your organization? A quarter of all respondents is not coaching stakeholders at all or allocates less than 30 minutes per week to this task. The rest allocates various amounts of time to stakeholder education, most commonly around an hour or two per week. Question: How much time do you spend in total per week to learn from books, blogs, newsletters or from other scrum masters, for example, in communities? Three-quarters of all scrum masters spend at least an hour a week on educating themselves, 30 % of them up to three hours a week. A typical scrum team based on this survey has more than seven members and runs a two-week sprint. If you do the math - the total amount of time spent on scrum ceremonies, educating herself, or training teammates and stakeholders, respectively, is about 11.50 hours/week. Learn what other activities scrum masters of a single team turn to as well in the next paragraph. "Preparing meetings, presentations, thinking through the habits of the team and prepare for the retro, self-reflection, writing internal blogs, preparing and executing a strategy/plan for organisational change towards agile. " "I joined a team mid-flight where the PO was doing both PO and SM, and it's very challenging to build trust with the team and to inspect and adapt. Some team members do not believe there is anything to improve, yet they never meet their sprint goal. " "Other tasks are: working on impediments, preparation of the physical task board. " "[I am] also spending a huge chunk of time doing the typical PM chores: project checklists, plans, etc. " "The majority of my time is spent on helping remove impediments and team coordination with waterfall teams (all of our LOB teams are componentized). Also, I spend a good deal of time on reporting initiatives and internal "agile" initiatives. " "[I am] working in LeSS with four teams in total, spending 3-4 [hours] [syncing] with other SMs and Teams. " "[I am] working with a nimble startup trying to align with waterfall processes within a bank, trying to broaden [the] Agile adoption. " "Depending on the sprint, I may spend a few hours preparing for [the] retro. " "In particular, we have "corrupted" scrum to best feed the context of our company. I would not call it scrum, we are doing something based on it, we try to defend the values and principles, but the flow itself mutates based on the needs of the team. " "[I am] liaising with other teams, external vendors. Aligning [the] team to [the] org process and tools. Metrics and reporting. " "Gather Agile metrics and prepare reports for leadership. " "As an Agile Coach, we spend more time on outside teams than we do with the direct team. Really, only one team for a Mid/Sr level SM? I call BS on that. " "Training opportunities usually appear in regular Sprint Events, which I do not count separately from those events. Usually, training happens in bulk in one week, when I spend most of my time on training only. Then training occurs less. That is why I put a middle ground for training as if spread across several months. " "I also observe a lot [of] people interactions and help with conflict resolution. " "In my organization, we are still in [the] process of implementing scrum. The involvement of management and organization to do scrum is minimal. The organization wants to be agile, but not adopt agile practices (not yet by even doing all the ceremonies). Long way to go! " "Some details about my support: it is about coaching people, ensuring proper implementation of ceremonies and adapting scrum framework to a non-IT environment. " "I co-locate with my team. I listen to conversations in the team room to determine if things are going well, or [if they] need my help. As a [scrum master], you have to listen for what is NOT spoken and follow-up on those concerns just as much as what IS spoken. I have a lot of 1:1 conversation with team members and encourage them to follow-up on items as a result. This empowers the team member, and the team grows." Yo scrum master, whatchadoin all day? I am afraid; we cannot answer that question given the non-representative nature of the survey. However, if you take into account what respondents also list in the 'other tasks' category, you will get a pretty good impression of the nature of the real-life 'scrum master position' nowadays. Hi Stephan, what about the time spent with other SM (within a formal or not CoP)? Maybe to consider in your survey. Thanks Stefan, I guess also you read this article from Mike Cohn (https://www.linkedin.com/pulse/what-happens-when-during-sprint-mike-cohn). The interesting part for Scrum practitioners is the usual length of the ceremonies and the fact he split Backlog refinement in 3 potential events (the refinement itself, the estimating and the prioritization), I found this idea interesting for your survey to show more details about those activities where a Scrum Master could be involved. Hi Stefan, I guess the legend of daily Scrum graph is incorrect. Anyway, I would like to suggest one more thing to consider as an improvement of the survey. Indeed a training or educational time often needs time to prepare not only for junior SM (I mean along situations we encounter we are more or less junior to them). On top of that activity of helping people, a SM must be available to “Go and See” how things are going (this means walk in different aera of the company) . If he is busy doing activities, he can miss what happening not intervene but to prepare some coaching or training activities. Wanda, the survey was run initially in AoP’s community — that’s 18,000-plus agile folks globally. The set of questions is included in the article. 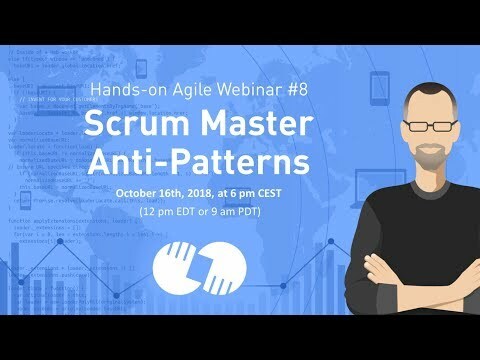 Hi Stefan, this was really interesting to see how scrum masters dedicate their time. Thank you! I was left feeling rather surprised at how under-utilised scrum masters appear to be? Your results appear to indicate the opposite of what the Scrum Guide encourages – that scrum masters are dedicated to one team, and that they’re actively involved in coaching teams to self -organise and thrive. Were your questions inclusive of all aspects of scrum mastery? Reading the comments, many sound bound by organisational structure that doesn’t encourage autonomy. Was the survey world-wide, European, or based in one country only? I was surprised by the size of the teams as well as. I would have guessed no more than five people. I think I should probably run a larger survey in autumn — there is more to learn. I’m surprised that more time isn’t spent on facilitation preparation and training in the organization. I try to prepare a facilitation guide for every ceremony. Meetings too. Generally I find that any training takes twice as long to prepare for than it does to execute.